Pompeii is a vast archaeological site that continues to yield treasures buried beneath the pumice. 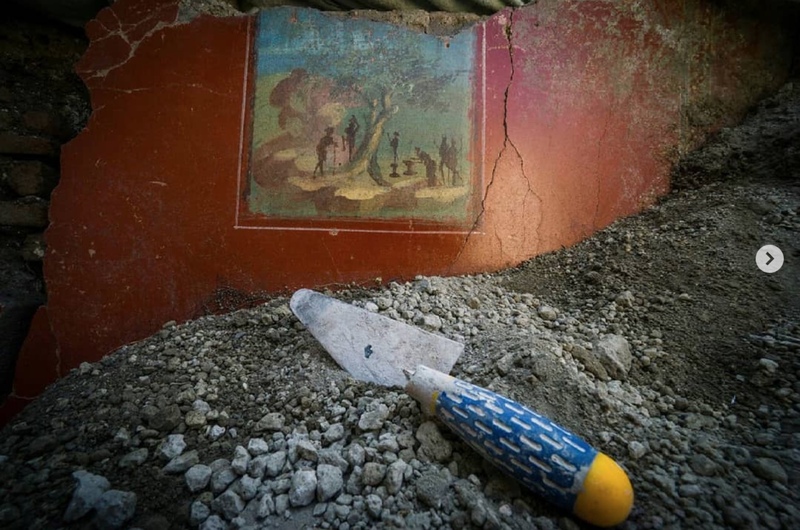 This summer, workers discovered new murals and artifacts at the site of a wealthy homeowner's estate, nicknamed House of Jupiter for a statue of the god found there. The house was fully decked out in what is referred to as first Roman style, or primo stile pompeiano, with many of its rooms painted in vivid shades of yellow, green, and red. In addition, there was a lavish central atrium that was also found inside the House of Jupiter. Nuove scoperte nella Regio V. Casa di Giove. Dagli ambienti di rappresentanza attorno all’atrio emerge una decorazione, in primo stile pompeiano, con riquadri di stucco riproducenti finte lastre marmoree dai colori vivaci. Video del Direttore Generale @massimo_osanna • • New findings in Regio V. House of Jupiter. Decorations in First Pompeian Style are emerging, with stucco squares reproducing fake marble slabs in bright colors.